DETAILS: Plan an amazing day with your morning coffee and a stunning bird’s eye view of the Gulf. “The Coast is Clear” is that rare find – a gorgeously renovated coastal retreat that combines convenience, comfort and location. Just a few yards from the Gulf, this 4-bedroom, 4.5-bathroom home features a chef’s kitchen and stunning outdoor spaces, including a private pool and a third-floor tower with views of the turquoise waters you came for. The first floor living room offers French doors, a vast sectional sofa, walnut floors and a flat-screen television – the perfect setting for movie night with friends and family. Just down the hallway is a guest bedroom with a queen bed, private bathroom with a shower/tub combo. Adjacent is another guest bedroom with a king bed, private bathroom with a shower only. Next door is a third guest bedroom with a shared bathroom with shower only. A first-floor bonus room has a queen sleeper sofa. On the second floor, the gourmet kitchen features select stainless Thermador or Bosch appliances, including a gas range. Designer cabinets, Quartz countertops and candelabra fixtures over an expansive island make this a great place to visit with friends and family while preparing a meal. The dining area has seating for 10, while the counter has seating for an additional 5. The second floor living room features a vast flat-screen television and balcony access via French doors. The master bedroom on the second floor features a king bed, private balcony access and a private bathroom with a double vanity and shower only. You’ll find a guest bathroom with shower only just down the hall. Ascend the staircase to the third-floor tower for stunning Gulf views – or to just hang out. A twin sleeper sofa makes for a quiet place to sleep. 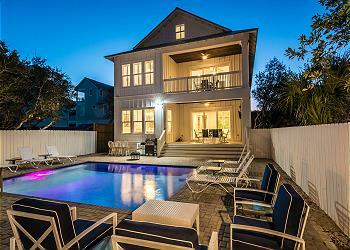 This coastal gem sleeps 14. While the newly renovated interior draws the eye, the private pool is what sets this 30A getaway apart. Spend a morning on the sugar-white sands of the Emerald Coast and the afternoon lounging poolside. All of the fun of Rosemary Beach is right next door, while Seaside lies just down the road. Call 360 Blue to book “Coast is Clear” today! We had a great time and the house is fabulous. It was wonderful for adults and teens. Great location short walk to beach and excellent location!! The decor of this house is top notch ! We cherished every moment, the Coast is Clear house was perfect for our family vacation to Inlet Beach. We especially loved the outdoor sitting and dining areas. Our chairs were set up and waiting every day at the beach. The pool was also fabulous and suprisingly private. This was our first time and we can't wait to come back and stay here again! We are so delighted that you enjoyed your vacation with us in Inlet Beach! We agree that this home is a wonderful option for a relaxing getaway and the outdoor space here is second to none! We look forward to hosting you all here again soon!